In a 17th century that didn't quite happen lies a world of mud, blood, mayhem and magick. England is fast descending into anarchy. A multitude of political and religious factions struggle for supremacy. Magickal pollution taints the country side. Creature long dismissed as legends awake. Obsessive scientists meddle with the very elements of nature. Crazed inventors create mad machines. Fanatics of every persuasion vie for power, while war, famine and witchcraft stalk the land. The king is dead. Oliver Cromwell and the gigantic clockwork war machines of the New Model Army do battle with the cavalier-alchemists of Prince Rupert for control of the country, while ordinary folk struggle for survival. In a world where every man is against his brother, can you and your fellow adventurers - armed with musket, sword, clockwork and magick- hold back the tide of war? 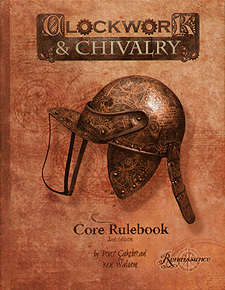 Clockwork & Chivalry returns in a complete standalone 2nd edition featuring the new Renaissance engine - a fast, grim, heroic D100 role-playing system designed for thr world of black-powder weapons, political machinations and fanatical righteousness. Alchemists, diggers, dragons, ghouls, engineers, mercenaries, puritans, ranters, royalists, satanists, thieves, witches... which side are you on?